Product DetailsFunko Pop Warhammer 40,000 transitions the miniature wargame from the tabletop to the vinyl display case. Highlight some of the warriors found in Warhammer 40,000, the line was first revealed at London Toy Fair 2019. 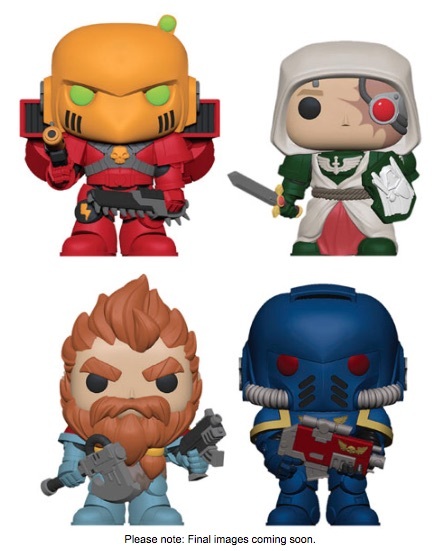 The extensive Warhammer 40,000 universe lends itself to many possibilities in the Funko Pop Warhammer 40K line, especially when you account for all the squads, chapters and armor. The initial set includes four choices: Blood Angels Assault Marine, Blood Claw Space Wolves, Dark Angels Veteran and Ultramarines Primaris Intercessor. Buy the Warhammer 40K game on Amazon. Part of the Pop! Games line, the Funko Pop Warhammer 40,000 figures are larger than the typical Games Workshop editions used in the actual gameplay. Pop! vinyl figures generally stand around four inches tall, and there is no extra painting required. Check back for more details on Funko Pop Warhammer 40,000 and let us know in the comments if you spot any other figures. Buy figures from Pop in a Box.